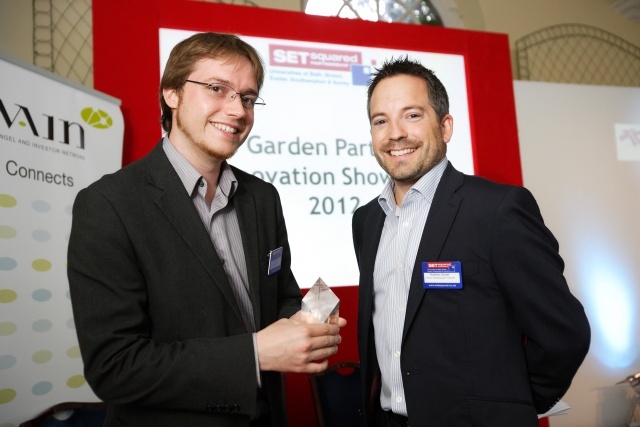 At the annual SETsquared Garden Party and Innovation Showcase in Bristol last week, the pioneering technologies showcased included medical implants, audio devices and automated monitoring of social media. Some of the South West’s most innovative technology companies from the SETsquared Business Acceleration Centres at the Universities of Bath and Bristol presented their businesses to large corporate companies, prospective investors and grant-funders at the event in Goldney Orangery, which attracted over 150 delegates – more than in the previous eight years. In a time of economic uncertainty, the SETsquared Centre in Bristol was proud to announce continued success in it’s member companies’ fund-raising, achieving over £65mof investment in the last 5 years. During the evening, eight selected companies entered a 60-second ‘Elevator Pitch’ competition to promote their businesses. The audience, of Venture Capitalists, SWAIN investors, representatives of the grant-funding and venture capital communities from London and the South West, senior executives from major corporates plus supporters and mentors of the SETsquared activity, voted for the best elevator pitch. The winning pitch, from Luke Marsden of HybridLogic (pictured, left, receiving his award from Nathan Guest of Veale Wasbrough Vizards), explained how their innovative and patent-pending hosting platform solves three huge problems faced by web hosting companies and users of cloud infrastructure: keeping websites fast when they get spikes in traffic, automatically recovering in less than a minute when anything breaks, and allowing users to roll back to any point in time if they make a mistake. With the recent high-profile outages of service providers, this technology will be of immense benefit. A further 7 ventures that are supported by the SETsquared Centres of Bath and Bristol showcased their work, including innovative businesses as varied as smart metering, Deep Brain Stimulation and online presentation tools. EZE Vidra, Google’s Head of Campus, gave the keynote speech, outlining his thoughts on the future for high-tech startups, commented that the UK was a real technology cluster and that SETsquared was a key part of that. Sponsored by the South West Angel and Investor Network (SWAIN), Veale Wasbrough Vizards, Baker Tilly and the SW Microelectronics iNet, the Garden Party provided an invaluable opportunity for the region’s high-tech, high-growth companies to network with potential investors and corporates.